Materials: crochet acrylic yarn, fur yarn, 5&16mm crochet hooks, safety eyes, fiber fill, felt hearts. With fur yarn & 16mm crochet hook create a magic ring with 4 sc. Place a stitch marker into the last stitch. Round 2: *1sc into the 1st stitch, 2sc into the 2nd stitch* repeat from * to * around. Round 6: 1sc into the 1st stitch, 2sctogether around. * In the end of round 7 stuff the body. Round 10: *1sc into the 1st, 2sc into the 2nd * * repeat from * to * around. out to the 2nd. repeat around. In the end grab both tales, pull them tightly, make a very tight knot and hide the tales inside. With fur yarn & 16mm crochet hook, create a magic ring with 2sc, you don't have to tight the ring, 1sc in each of 2 stitches, cut the yarn and finish your work. With fur yarn & 16mm crochet hook, create a magic ring with 3sc, you don't have to tight the ring, 1sc in each of 3 stitches, cut the yarn and finish your work. With regular yarn and 5mm crochet hook, create a magic ring with 6sc, tight the ring, place a stitch marker into the last stitch. Round 1: 2sc in eac stitch around. In the end of round 2, slip stitch to the 1st stitch, cut the yarn and finish your work. With regular yarn and 5mm crochet hook, chain 6. Slip stitch to the 1st stitch to form a ring. Round 1: 1sc in each chain around. *In the end of round 2 slip stitch to the 1st stitch, cut the yarn and finish your work. Place the safety eye in the middle. With fur yarn& 16mm crochet hook, create a magic ring with 3sc, you don't have to tight the ring. Round 1: 1sc in each stitch around. In the end of round 5 cut the yarn and finish your work. Sew the parts to the body and glue the felt heart to the belly! 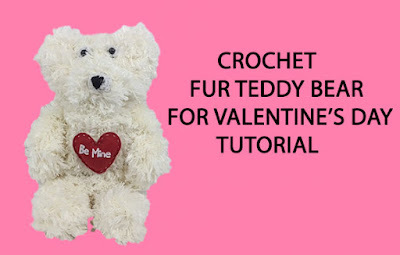 You can watch our video tutorial witch shows you how to crochet this lovely fur teddy bear!